In this tutorial I will show you how to mass convert Vtf's into pngs and jpgs, which then can be mass uploaded to a texture pack's page here on ocmapdb. For this tutorial you will need vtfedit. Click on the tools tab, then click on convert folder. A batch convert window will pop up, in the input bar select the folder containing all the custom textures. For the output folder select the folder you would like the vtf's to be placed in as their new format. Check to then in the dropdown list select png or jpg ( this is right under to vtf ). 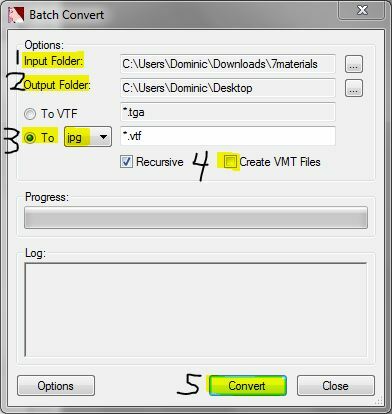 If you do not want a vmt uncheck create vmt files, now click convert! NOTE: CONVERT TO JPGS if you want to save the database some space, the quality difference is unnoticeable. Hooray all your vtfs have been converted into sweet pngs or jpgs! now upload them to your texture page!